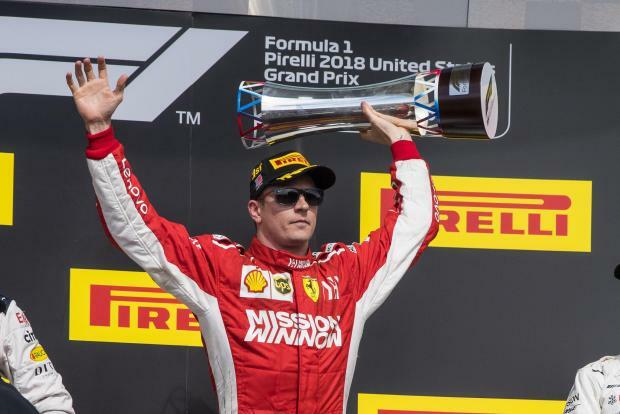 Kimi Raikkonen celebrates his victory at the US Grand Prix. The victory was the 39-year-old Finn's first since the Australian Grand Prix of March 2013, a gap of 113 races dating back to when he was racing for Lotus, and 21st of his career. Red Bull's Dutch youngster Max Verstappen finished a surprise second after starting 18th in a thrilling finale with the top three cars separated by just 2.1 seconds at the chequered flag. Ferrari's Sebastian Vettel, Hamilton's only title rival, spun down to 15th on the opening lap but fought back to finish fourth -- a result that means the championship remains open until Mexico next weekend. Hamilton now has a 70-point lead over his four-times champion rival with 75 points remaining to be won from the last three races. "I actually thought we would have been able to do better but this is the best we were able to do in the end," said Hamilton. "We just have to keep working and keep pushing for the next race. "I'm not really quite sure how the strategy ended up like that," added the Briton, who had started on pole position but lost the lead to Raikkonen into the first corner at a sunny Circuit of the Americas. The Briton made two pitstops to his rivals' one, losing crucial seconds on fading tyres before being called in and staging a late charge over the final 19 laps from fourth with 12 seconds to make up. Team mate Valtteri Bottas helped by letting him through for third place, but the Finn then lost out to Vettel and finished fifth. Hamilton, a second behind Verstappen at the end, went wheel-to-wheel with the 21-year-old with two laps left but failed to make the move stick and ran wide in his last chance to grab second. "Did you win the championship?" enquired 2007 world champion Raikkonen, whose last previous win with Ferrari was in 2009. "No," replied Hamilton. Raikkonen has set a new record for the most races between wins, breaking Patrese's previous record of 99 races ???? This is Raikkonen's 112th race, including one DNS, since Australia 2013 ??? ?